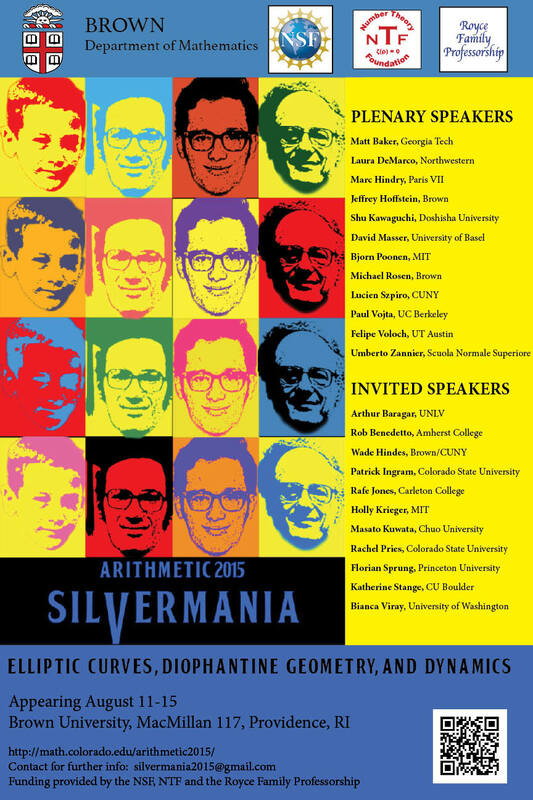 Please join us for a celebration of the mathematical career of Joseph H. Silverman. Elliptic curves, diophantine geometry, and arithmetic dynamics in beautiful Providence, RI. We aim to bring together a community of researchers at all stages, in a collaborative, casual atmosphere. There will be a poster session for graduate students, and some exciting special events. The conference will make available resources for mathematicians with family responsibilities. Click on the poster for a PDF version you can print! Travel info, registration, funding applications, and schedule available on this site. For questions, please email silvermania2015@gmail.com. Participant list, travel info, family info updated. © Web Master: Katherine Stange | Using a design by Cirkuit Networks, Inc.